The 60th annual GRAMMYs are a wrap — and what a night it was for Los Angeles musicians! Bruno Mars swept the 60th annual GRAMMYs, taking home awards in all categories nominated including the night’s biggest wins: Record of the Year and Album of the Year (“24K Magic”), and Song of the Year (“That’s What I Like”). The Los Angeles AFM Local 47 artist also won in the categories of Best R&B Album, Song and Performance. Read the full story and complete list of 2018 GRAMMY-winning recordings featuring AFM Local 47 musicians at listen-la.com. 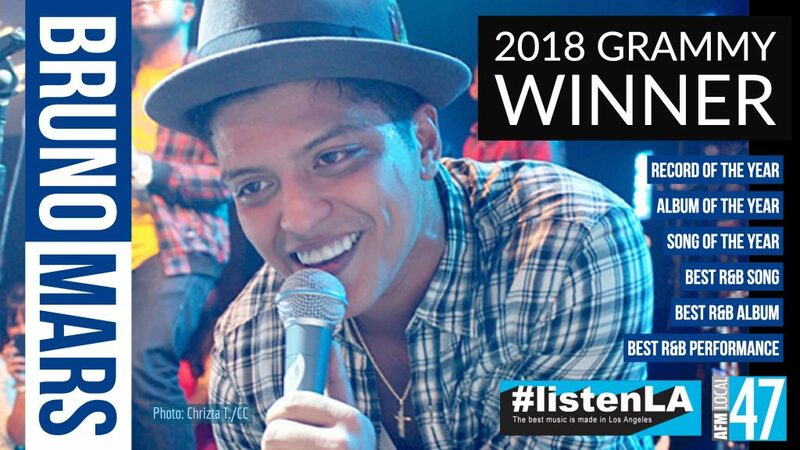 This entry was posted in All News, Features and tagged #listenLA, bruno mars, Grammy Awards, Grammys on January 29, 2018 by admin.